The following is primarily designed for the core OME developers who are contributing to our code base using Git. It should contain all the useful commands and configuration you need for doing most Git tasks. This section assumes that “gh” is your own personal GitHub repository, and “origin” is one of the official openmicroscopy repositories. In general, see the Git downloads page for installation options. Or you can use the binary installer. We recommend using either Git for Windows for a basic Git installation, or Cygwin for a full-featured Unix-style environment that includes Git. You can also use TortoiseGit for Git shell integration. You may also want to consider installing VirtualBox with a Linux guest OS to make your life easier. Lastly, when using Git on Windows, please be aware of the CRLF conversion issue. You will not be able to push back to this repository, but you will at least have something you can start looking at. Git provides a number of options which can make working with it considerably more pleasant. These configuration options are available either globally in $HOME/.gitconfig or in the .git directory of your repository. The file is in INI-format, but can also be modified using the git config command, as illustrated in the examples following. git config --global alias.graph "log --date-order --graph --decorate --oneline"
See Helpful command aliases for more examples. git config remotes.default "ome team origin gh official chris ola will jm colin"
Now, git remote update will check the above list of repositories. When you have work which you want to share with the rest of the team, it is vital that you push it to your GitHub fork. This will create a new branch, and the same command can be used to subsequently update that branch. As mentioned elsewhere, the “refs/heads/” prefix only needs to be used to create a new branch, and can be dropped for subsequent pushes. The flip-side of pushing your own branches is being aware that other OME developers will also be pushing theirs. GitHub provides a number of ways of monitoring either a user or a repository. Notifications about what watched users and repositories are doing can be seen in your GitHub inbox or via RSS feeds. See Be social for more information. Even if you do not feel able to watch the everyone’s repository, you will likely want to periodically check in on the current Pull Requests (PRs). These will contain screenshots and other updates about what the team is working on. When the PRs have been sufficiently reviewed, they will be merged into the develop branch so that others’ work will start to be based on it. Once your branches have been merged into the mainline (“develop” of openmicroscopy/openmicroscopy) you should delete them from your repository. This way, anyone looking at your fork clearly sees what is currently in progress or upcoming. Although everyone has a slightly different way of working, the following command examples should show you much of what you will want to do on a daily or weekly basis when working with OME via Git. git checkout my-work  # Just to be sure. When committing the code you have just modified/merged your commit message should refer to related tickets. E.g. “See #1111” will link the commit to the ticket on trac, and “Fixes #2222”” will link and close the ticket on trac. git commit -m "Add message here and refer to the ticket number. See #1234. Fixes #5678"
If you want to add more than a short one-line message, you can omit the -m “message” and Git will open your specified editor, where you should add a single line summary followed by line space and then a paragraph of more text. See Commit messages for more discussion. After you have committed, you can keep working and committing as above - the changes are only saved to your local git. Add the -a to list remote branches too. If you have forgotten what you did on a particular branch, you can use git log. Add the -p flag to see the actual diff for each commit. Once you have pushed, you can open a “Pull Request” to inform the team about the changes. More on that below. If you have been permitted write access to someone else’s forked repository, or you have granted someone else write access to your repository, then there is a further aspect that you need to be aware of. Rebasing allows you to update the ‘base’ point at which you branched from another branch (as described above). You can also use ‘rebase’ to organize your commits before merging. $ git commit -m "Merge branch"
If you do not want to modify the submodule state, run git submodule update. Be careful though, the git subdmodule update command will silently delete all local changes under the submodule. If you want to keep your changes, make sure you have pushed them to GitHub. git commit -m "Merged branch"
git commit -m "Move to latest bioformats"
There are Git hooks available to make working with submodules safer. See post-merge-checkout for an example. All commit messages in git should start with a single line of 72 characters or less, following by a blank line, followed by any other text. You can read more about commit messages at A Note About Git Commit Messages. We roughly follow the git-flow style of naming and managing branch. 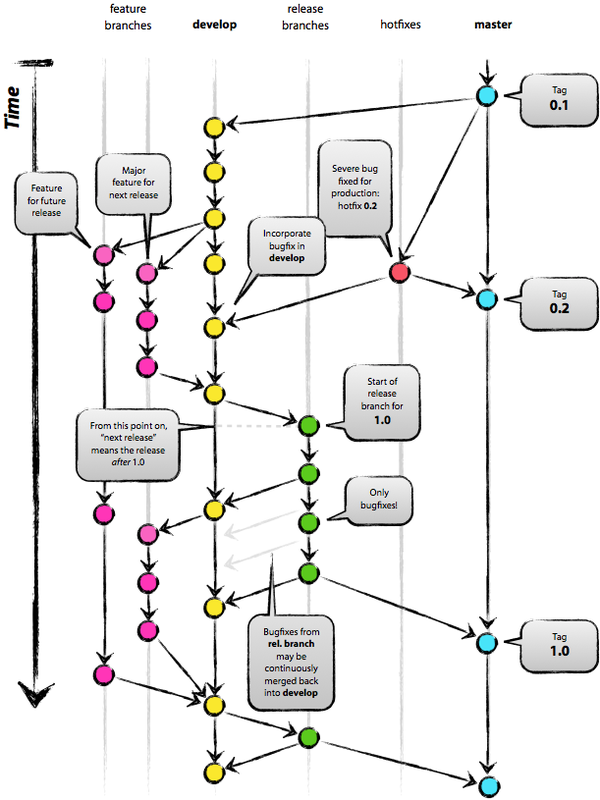 Info about the idea can be found under A successful Git branching model. There is also a screencast available on Vimeo. The master branch is always “releasable”, almost always by having a tagged version merged into it. The develop branch is where unstable work takes place. At times, another stable branch with the version name appended (“dev_x_y”) is also active. PRs merged into this stable branch are also rebased onto develop. For more information about how multiple branches are being maintained currently, see Continuous integration. One large goal of the work with the forked repository model is to have both team members as well as external collaborators be aware of upcoming features as they happen, and have them be able to comment on the work as quickly and easily. There is a danger of some members of the community not being aware of which branches are active and applicable, but if our weekly meetings contain a summary of what work is happening in which branch as opposed to just which tickets are in progress on the whiteboard, then it should be fairly easy for someone from the outside to get involved. What follows is an explanation of the overarching way we categorize and review our branches. This is not required reading for everyone. To make working with a larger number of branches easily, we will initially introduce some terminology. Branches should typically be in one of three states: investigations, works-in-progress (WIP), or deliverables. At the bottom of the figure above are the investigation branches. These are efforts which are being driven possibly by a single individual and which are possibly not a part of the current milestone. They may not lead to released code, or they may be put on hold for some period of time while other avenues are also investigated. For an investigation to move up to being a work-in-progress, it should have more involvement from the rest of team and have been discussed and documented via stories, mini-group meetings, etc. Where necessary – which will usually be the case – the major components (Bio-Formats, the model, the database, the server, at least one client) should be under way. Finally, deliverable branches are intended for inclusion in the upcoming milestone. They have all the necessary “paper work” – requirements, stories, tasks, scenarios, tests, screencasts, etc. Where support is needed to get all of the pieces in place, the rest of the team can be involved. And when ready a small number (mostly likely just one) will be finalized and merged into “develop” at a time. This represents the post-sprint “demo” concept that has been discussed elsewhere. One non-branch type that should also be kept in mind is the backlog. 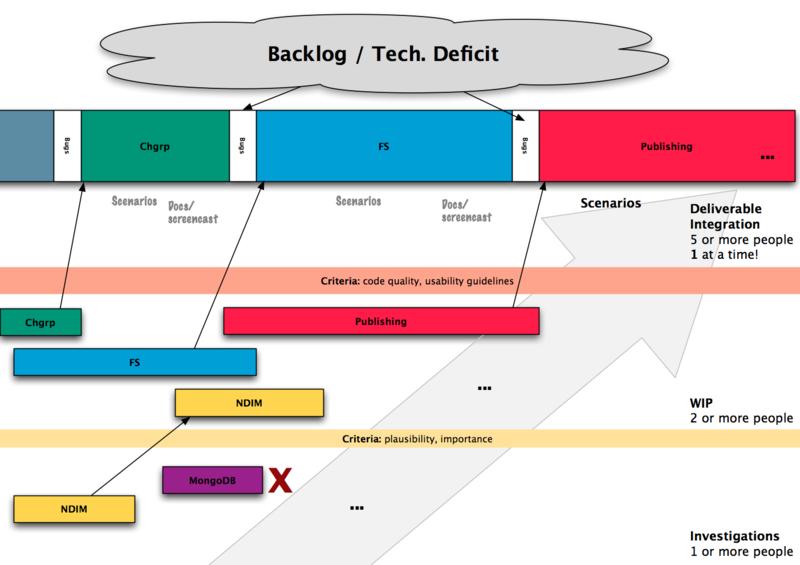 Between major deliverables and while a WIP is being ramped up to a deliverable, the backlog should be continually worked on and the fix branches also merged in once tested and verified. With the definitions, we can walk through the progression of a branch from inception to delivered code. First, someone, perhaps even an external collaborator, creates a branch, typically starting from master or develop (having them branch from the mainline should hopefully makes things easier later on). Work is first done locally, and then eventually pushed to github.com/YOURUSER/openmicroscopy. If you have given access to particular members of the team, then they may want to work directly on that branch. Alternatively, they may create branches from your branch, and send you commits – either via Pull Request or as patches – for you to include in your work. You will want to start making others aware of your work so you can get feedback, but at this point there may not even be a well-defined requirement / story for your work. There should, however, at least be tasks for what you are working on in the whiteboard, so others know what is happening. It may be necessary, regardless, to also email ome-nitpick, ome-devel, or some subset of OME developers, with the branch name you want them to take a look at. A Pull Request could also be used. After it is clear that there is some interest in your investigation branch, then the related stories and possibly requirement should be flushed out. The design of the work should be checked against the other parts of OME. For example, a GUI addition should fit into other existing workflows, and the implications on the other client (i.e. OMERO.web’s impact on OMERO.insight, or the other way around) should be evaluated. At this point, the branch will most likely be considered a work-in-progress and will need to start getting ready for release. The various related branches will need to be kept in sync. Whether through a rebase or a merge workflow, all involved parties will need to make sure they regularly have an up-to-date view of the work going on. Finally, the WIP branch will have advanced far enough that it should be made release-ready, which will need to be discussed at a weekly meeting. Often at this point, the involved developers will need help from others getting the documentation, the testing, the screencasts, the scenarios, and all the other bits and bobs (the “paper work”) ready for release. One at a time (at least initially), WIP branches will be picked and made into a deliverable. At this point, several people will have looked over the code and all the paper work, and the whole team should feel comfortable with the release-state of the branch. At this point, a Pull Request should be issued to the official openmicroscopy/openmicroscopy repository for the final merge. All the related branches in each individual’s repository can now be deleted. A major benefit of having the paper work per deliverable done immediately is that if it becomes necessary the mainline, i.e. the “develop” branch of openmicroscopy/openmicroscopy, could be released far more quickly than if we have several deliverables simultaneously in the air. A significant disadvantage to having separate lines of inquiry in separate branches is the possibility that there will be negative interactions between 2 or more branches when merged, and that these problems won’t be found until late in development. To offset this risk, it is possible and advisable to begin creating “temporary merge branches” earlier in development. and build and test this composite. This need not be done manually, but assuming there’s a convention like “all branches for immediate release are prefixed with ‘deliverable/’ ”, then a jenkins job can attempt the merge, failing if it is not possible, and run all tests if it succeeds. Any weekly testing we do can use the artifacts generated by this build to be as sure as possible that nothing unexpected has leaked in. If you have discovered that something in the proposed branch needs changing (and you do not have write access to the branch itself), then you can checkout the branch, make the fixes, push the branch, and open a Pull Request. git commit -a -m "My fix of the new_stuff"
GitHub’s “Open a pull request” page invites you to leave a comment under the PR title: we use this comment to describe the PR. A good choice of PR title and description are both helpful to reviewers of your work. For the PR description there may be template text already provided for you to edit. If so then do consider what it says but also feel free to change that template as much as makes sense for describing your PR. # issue a pull request, not possible to merge due to a conflict. Your branch should now be able to merge back into develop. This should only be done at the very end of a pull request just before it is merged into origin/develop. Multiple “pull origin/develop” messages in a branch would be very bad style.